Relax by the water at Mindil Beach and Lameroo Beach. Visiting Litchfield National Park and Fishing Charters & Tours will get you outdoors. 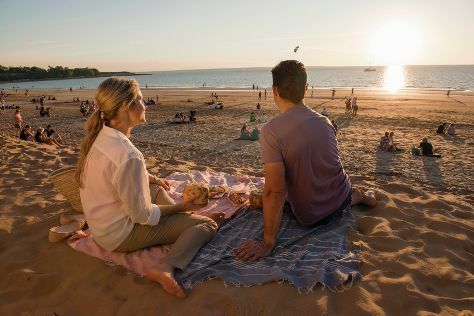 Explore Darwin's surroundings by going to Adelaide River (Adelaide River Railway Bridg, Adelaide River War Cemetery, & more), Litchfield National Park (Florence Falls, Magnetic Termite Mounds, & more) and Territory Wildlife Park (in Berry Springs). Spend the 15th (Fri) wandering through the wild on a nature and wildlife tour. Plan for a day of cool, family-friendly fun on the 20th (Wed) at Darwin Waterfront. There's still lots to do: look for all kinds of wild species at Crocosaurus Cove, take in the waterfront at Darwin Wharf Precinct, explore the striking landscape at Berry Springs Nature Park, and see the interesting displays at Museum & Art Gallery of the Northern Territory. Plan a Darwin trip in moments using our itinerary builder. If you are flying in from United Kingdom, the closest major airport is Darwin International Airport. In March, daytime highs in Darwin are 38°C, while nighttime lows are 28°C. Wrap up your sightseeing on the 10th (Wed) early enough to travel back home.